A Burson-Marsteller study analyzed how international organizations use social media. 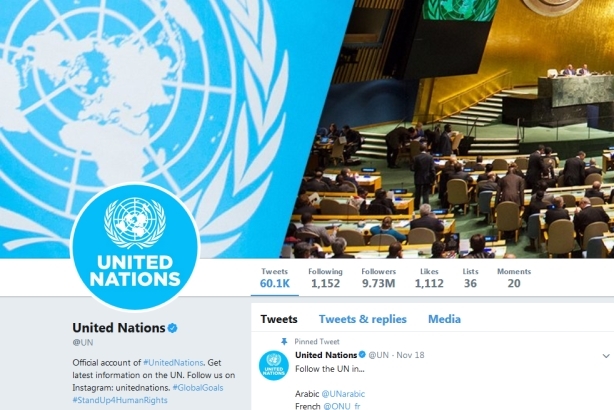 NEW YORK: The United Nations is the most-followed international organization across all channels on social media, with 16.9 million followers, according to a Burson-Marsteller study. UNICEF follows close behind, with 16.3 million followers, and World Economic Forum comes in third, with 10 million followers, the study found. The study, called Twiplomacy, focused on how world leaders, governments, and international organizations use social media. It analyzed 97 organizations’ social media presence across the six main channels: Facebook, Twitter, Instagram, LinkedIn, YouTube, and Google+. Matthias Lüfkens, MD of digital at Burson-Marsteller, noted the greater role international organizations have in the public dialogue. "They’re no longer in the league of international organizations," he said. "They’re actually competing with other news organizations." The World Economic Forum yielded the greatest number of likes and retweets on Facebook, Twitter, and Instagram over the past 12 months, with 33.5 million interactions. The creator behind the Davos summit was followed by UNICEF in this category with 25.6 million interactions and Greenpeace with 11.2 million interactions. The study said Facebook dominates other platforms in terms of interactions for audiovisual content. Native video posts generated 45% of all total interactions, even though they only made up a sliver (16%) of the almost 73,000 posts in the sample. The World Economic Forum’s one-minute explainer videos have received millions of views. Twitter has increasingly become a visual social platform, with only 5% of all tweets analyzed being plain texts. Five percent of all tweets included a native video, rendering an average of 263 interactions per tweet – that’s about 12% of all interactions. "I would tell [people seeking advice]: go visual," Lüfkens said. "Use all the visual tools available to you." @TheEconomist is the most followed Twitter account among international organizations. The three most followed personalities are Helen Clark, the former U.N. Development Programme administrator, President Obama, and Bill Gates. The study also looked at the leaders of 74 international organizations, leading it to conclude that the personal Twitter accounts of leaders "tend to have the best overall interaction rate." U.N. secretary general António Guterres was the most effective, with an average of 1,092 retweets per tweet, despite not being the most followed. On Instagram, where almost three quarters of the sample have an account, more and more organizations use its "stories feature." The study was based on the analysis of 171 Twitter accounts of international organizations, 113 Facebook pages, 75 Instagram accounts, 83 LinkedIn pages and 35 personal profiles, 88 YouTube channels, 82 Google+ pages, and 50 Periscope channels. The combined total of followers and subscribers on all six platforms is 145,120,969.